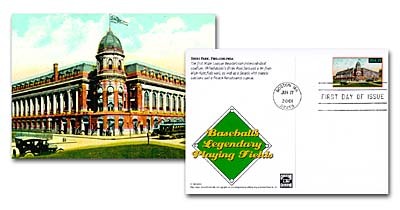 Another streetcar, in front of the ball park at the right. 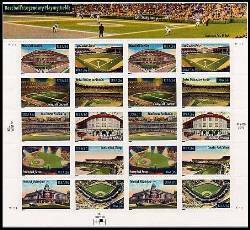 Ten designs, issued as a self-adhesive sheet of twenty, as a press sheet of 8 panes, and as a booklet of ten postal cards. The press sheet is printed with the panes tete-beche, so one could create interesting cross-gutter cuts. 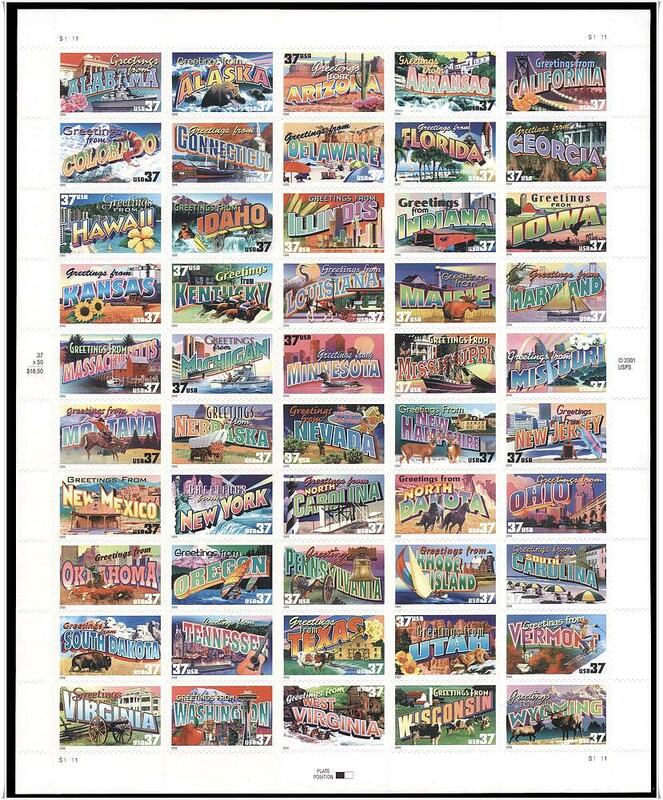 This was a fun set, with 50 designs, one per state - an old tradition for US stamps - each stamp designed to look like a picture postcard of the 1940s. 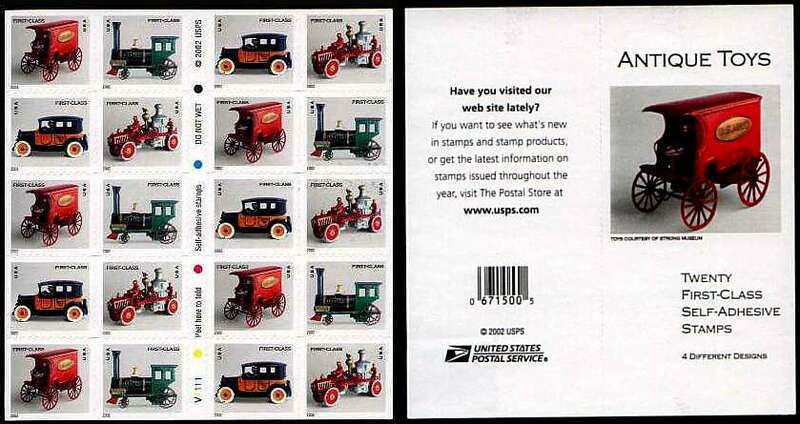 The first issue, in April of 2002, was so popular that they reissued the sheet with the new 37¢ denomination after the rate change at the end of June. 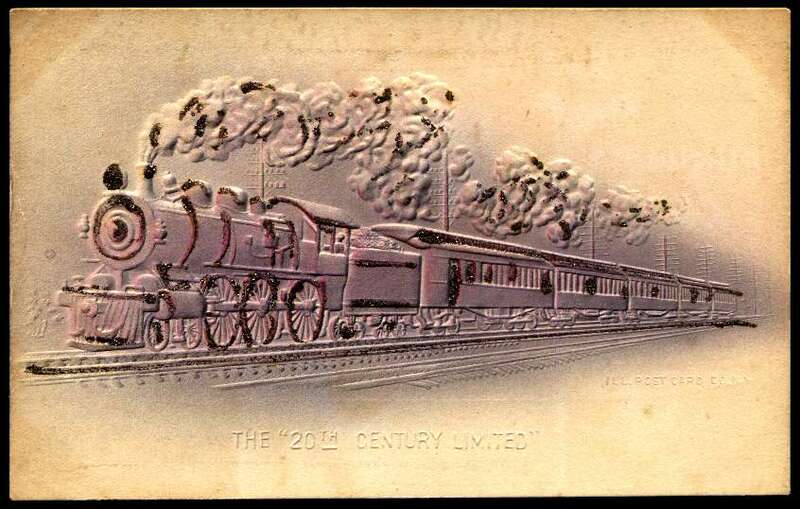 We rail philatelists had fun debating which designs had a rail connection, and found three, though two of them require some creative thinking. You be the judge. 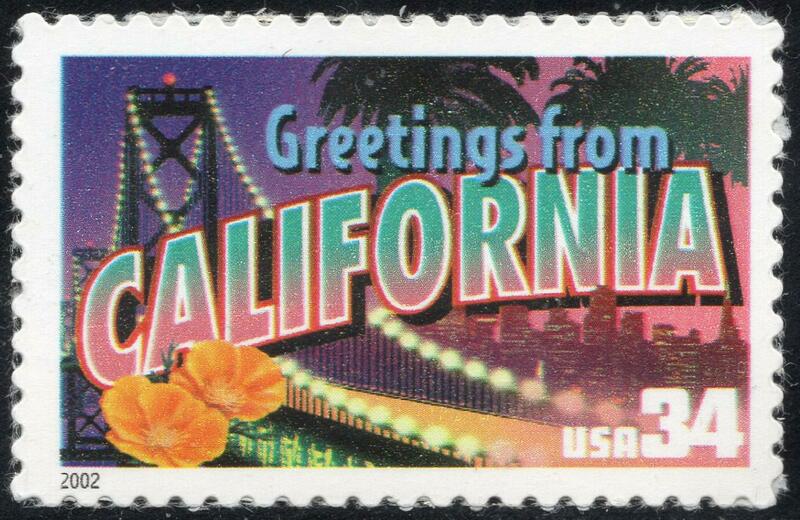 California Stamp - This one's a stretch for me, but some rail collectors include bridges that have rails, or even that USED to have rails! The latter is the case here - the bridge depicted is the San Francisco-Oakland Bay Bridge, which carried street cars on its lower deck from 1939 to 1958. 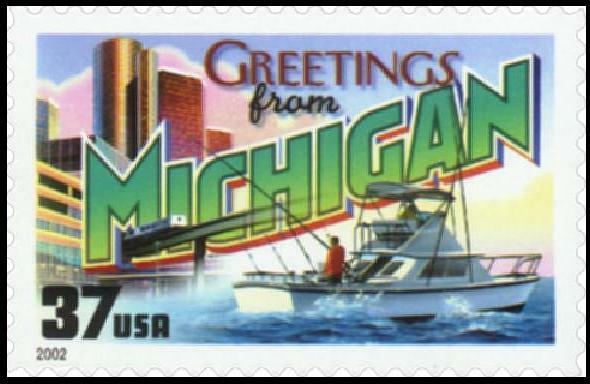 Michigan Stamp - It's a bird! It's a train! Yes, it's a train. 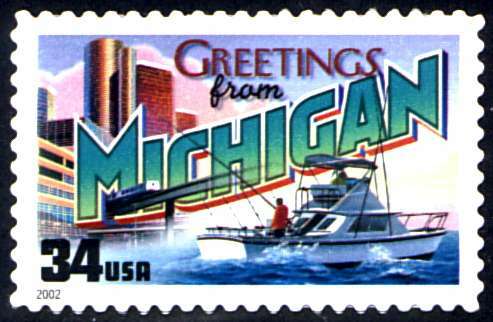 Emerging from between the legs of the "M" on the Greetings From America stamp for Michigan is the Detroit People Mover, or DPM, a fully automated system that operates over a 2.9-mile loop with 13 stations in downtown Detroit. 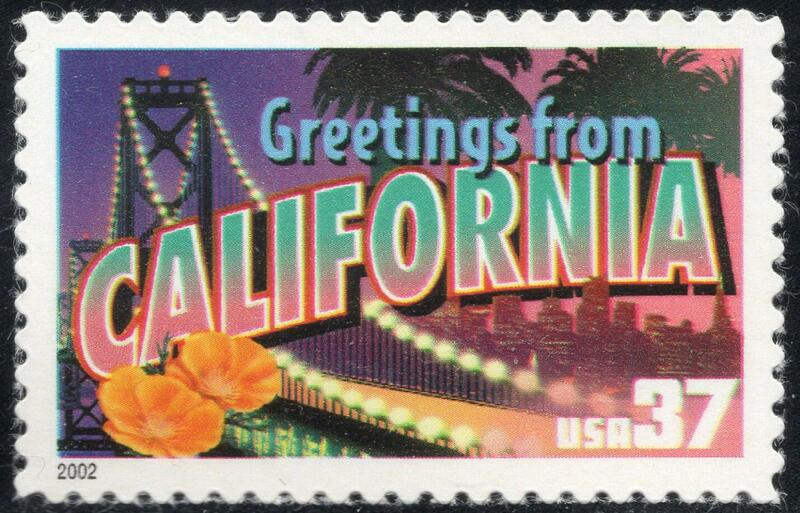 Inaugurated in 1987, it has never achieved the popularity hoped for, but carries an estimated 5,000 passengers per day around the downtown area. It takes approximately 14 minutes to travel the entire loop and the wait between trains averages 2-3 minutes. Contrary to a popular misconception, it is not a monorail - it runs on two rails that are bolted to the concrete track bed (no ties), but it is powered by a form of magnetic propulsion known as Linear Induction Motors or LIM, part of the mechanism for which is housed in a large blue boxed structure running under the center of the train, which is probably the reason many mistake the train for a monorail. There is an official web site for the system at http://www.thepeoplemover.com. 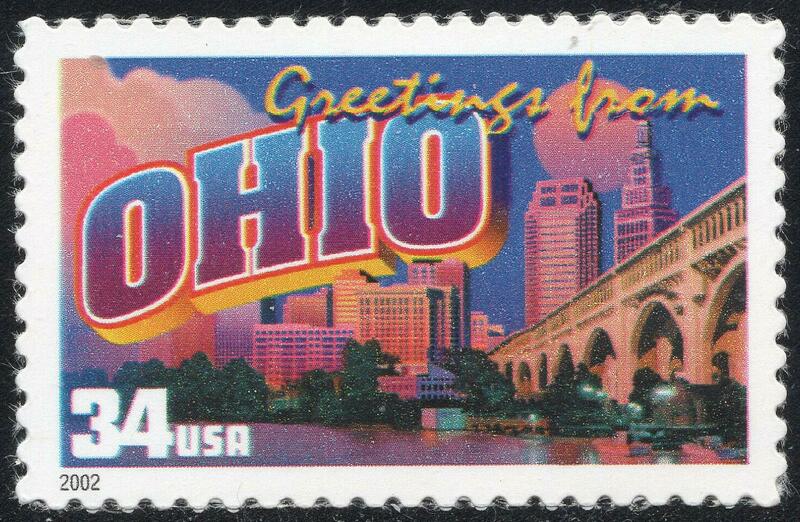 Ohio Stamp - This is another case of a bridge that used to carry rail traffic. 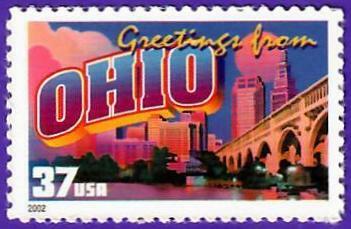 The stamp shows a view of Cleveland, and in the foreground is its Veterans Memorial Bridge, aka the Detroit-Superior Bridge, which opened in 1917. 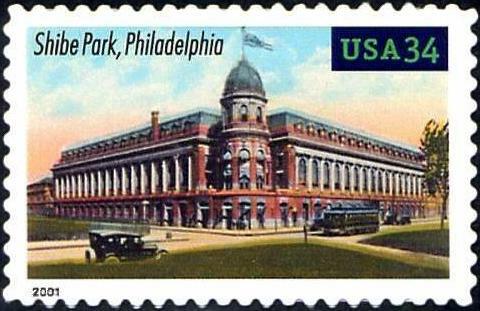 The original construction included a lower level for streetcars, which ran there until 1954. There were press sheets for both versions, but they were just two panes, side by side. The latest (2019) Scott US Specialized Catalogue lists combinations with a vertical gutter. 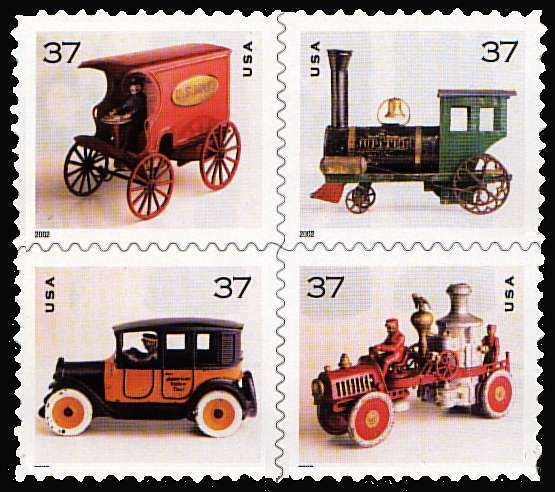 As part of the postal rate changes at the end of June, 2002 (one-ounce first-class postage increased from 34¢ to 37¢), this block of four antique toys was issued, first in a non-denominated version, and later with the 37¢ denomination inscribed. The non-denominated version was released June 7 nation-wide, while the denominated one was released in Rochester, NY on Friday, July 26. 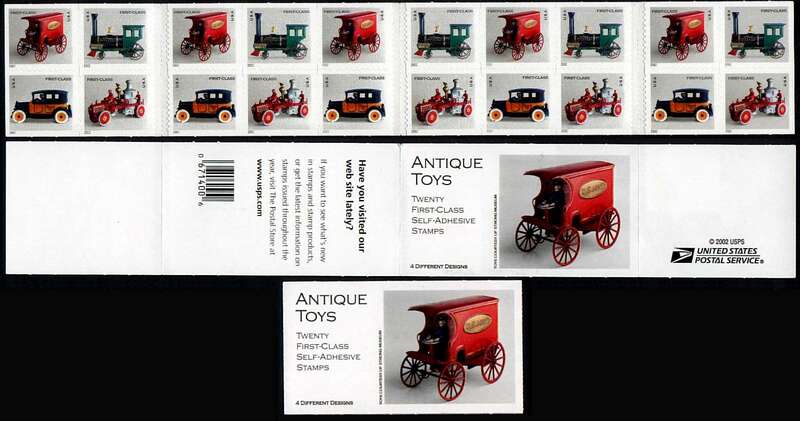 There are two formats of the non-denominated stamps - a "convertible booklet" and a "vending booklet." The denominated version is available in those two, plus a THIRD booklet format, and a coil. 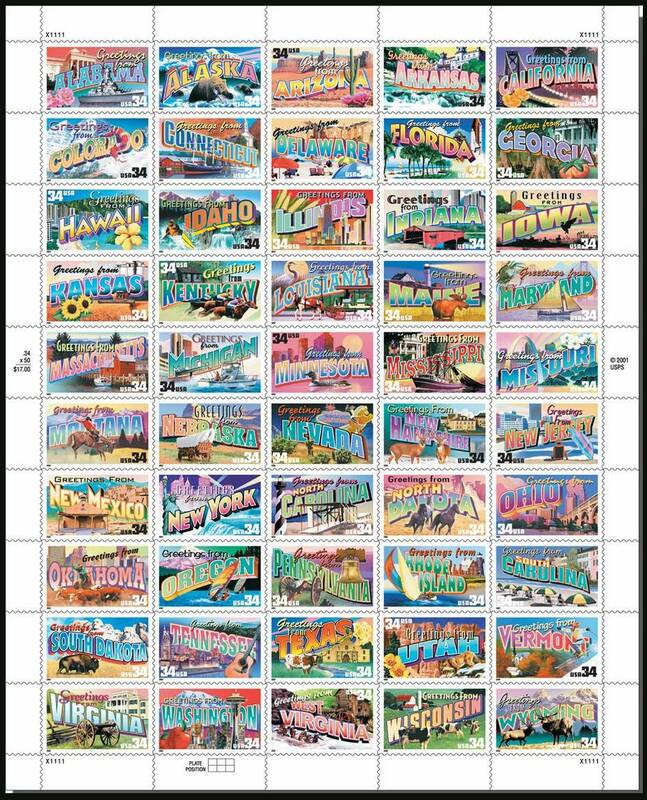 The First Day City for the non-denominated version was Washington, DC, but the stamps were on sale everywhere that first day, providing a great opportunity for all sorts of unofficial First Day covers. 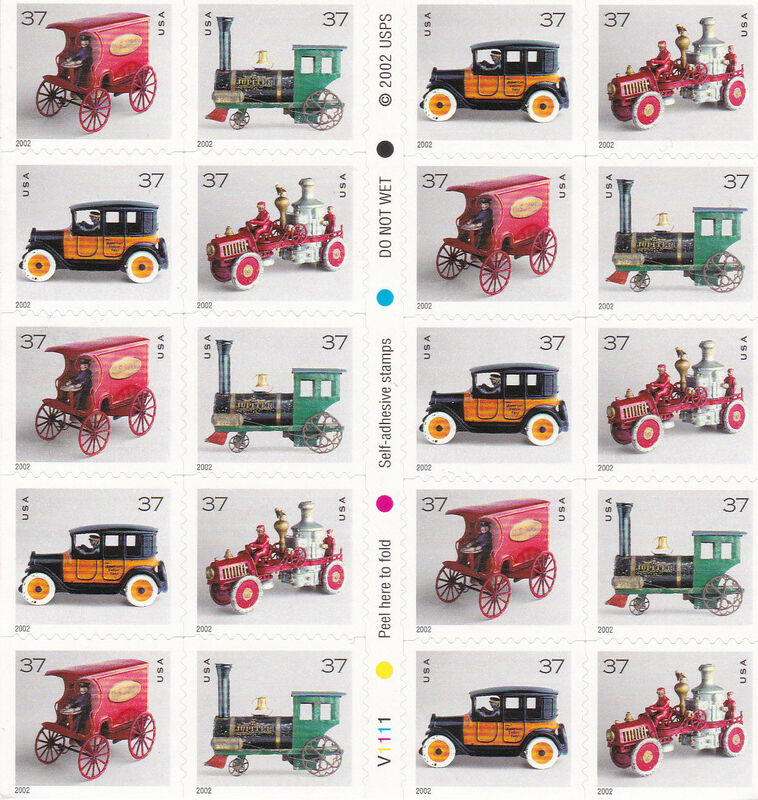 All I managed to do was to buy the stamps on the day of issue - I was totally unprepared for the philatelic opportunities. 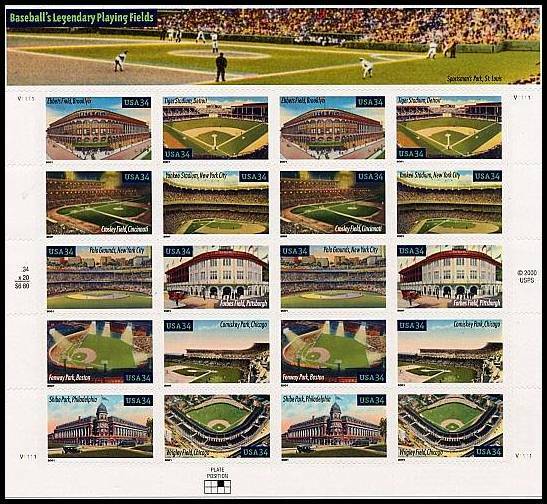 Note that, at least in this non-denominated booklet format, the perfed-on-all-four- sides format of the block of four shown in the advance publicity does not exist. 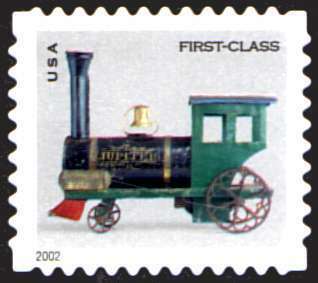 Above is the full booklet pane, and note that there are four distinct varieties of the train stamp - one with straight-edge at top, one with straight-edge at bottom, one with straight-edge at the right side, and one perfed on all four sides. 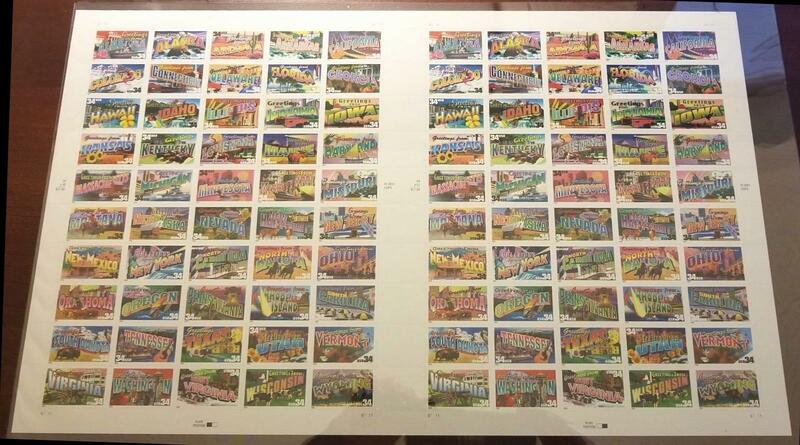 June 15 - My order from the philatelic caves arrived, and the vending booklet still has no perfed-on-all-fours-sides block. 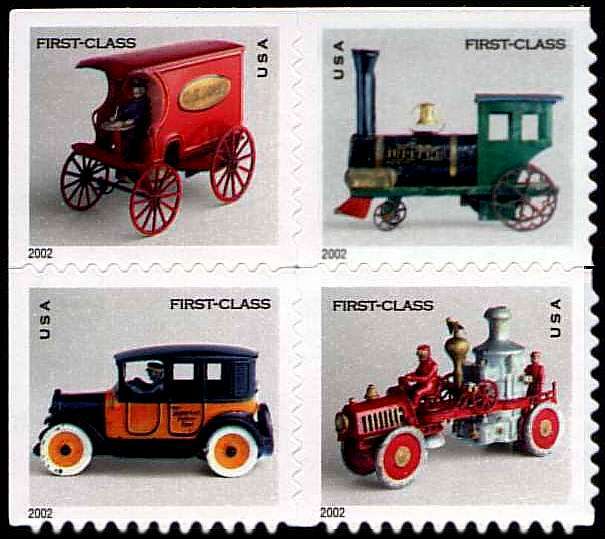 It has at least one more variety of the train stamp than the convertible booklet. 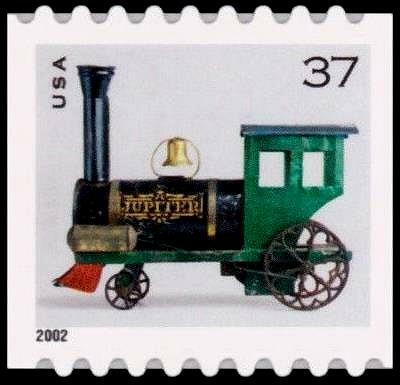 Note that it has one train stamp with straight edges at both top and right. There may be other differences between the two booklets, in perfs or color or some minor design variation, but I have not found any yet. The one I scanned here has a mottled background, but I had another with a smooth one, so this is just a minor anomaly in the printing. 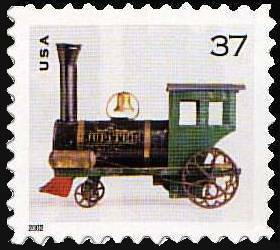 Again, there are many versions of the train stamp, if you count all the variations in type and locations of the diecut perforations. I count at least seven. 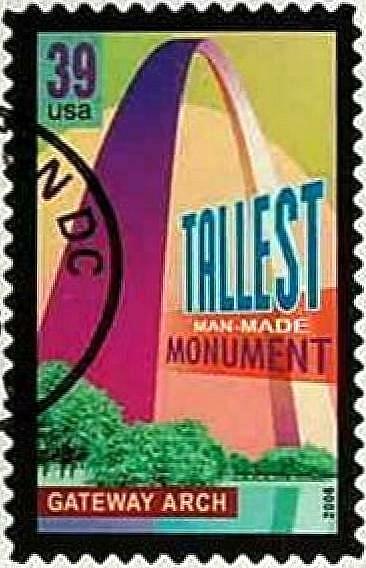 the Biggest, Tallest, Longest, Highest, whatever-est of our country's natural and man-made sights. It's a little too kitsch for me, but it's fun. BUT WAIT! WHERE'S THE TRAIN CONNECTION? 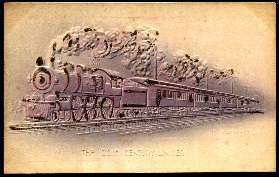 "Florence Wright and I decided that the arch in St. Louis had a railroad connection as the cars that you can ride to the top run on rails. We asked, and no one reading The Dispatcher objected." I'll let you go to the GATEWAY ARCH web site for a detailed explanations of how the "train" (that's what it's called) works.